A pair of famous Los Angeles establishments are doing their part to show support for the Los Angeles Rams, as they play in Super Bowl LIII this Sunday. Pink's Hot Dogs (Angel Viscarra). 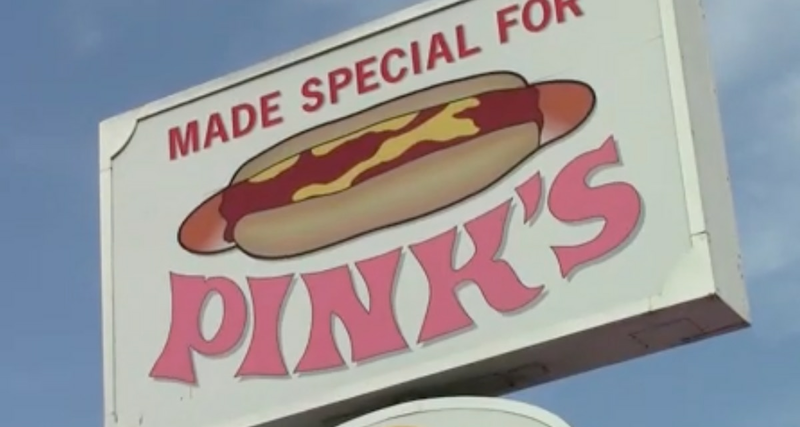 Pink's Hot Dogs in Hollywood and Randy's Donuts in Inglewood are both undergoing a major color overhaul in the days leading up to Super Bowl Sunday. Both establishments have been blasted with shades of blue and gold in support of the hometown Los Angeles Rams. The Rams will be playing against the New England Patriots this Sunday at Super Bowl LIII in Atlanta, Georgia. Pink's co-owner, Richard Pink, is proud of his company's commitment to supporting local sports teams. He noted that when businesses visibly support local fixtures, such as sports teams, it draws a strong response and turnout from the community. From blue and gold hot dogs to Rams-style doughnuts, Pink's and Randy's are two companies in Los Angeles supporting the local team. Angel is a Broadcast and Digital Journalism major, studying at the USC Annenberg School for Communication and Journalism. His work has also been featured in the Los Angeles Times, The Press-Enterprise, The Daily Trojan, and Reign of Troy. He is also an on-air correspondent for USC's sports broadcast program, Sports SCene.